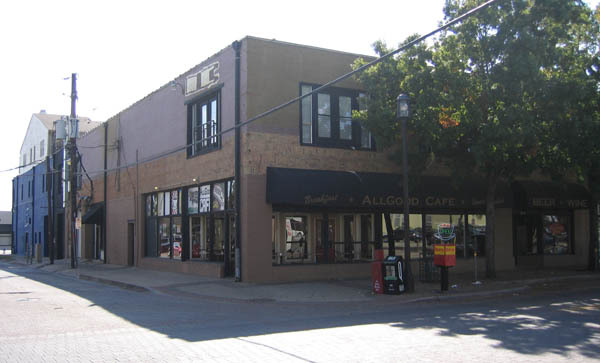 Located on the corner of Main and Walton, AllGood Cafe is in the heart of Deep Ellum. If you’re looking for a cool new restaurant to try, I highly recommend checking out AllGood. The combination of a great overall vibe, excellent menu, and Austin, Texas style musical influence, sets AllGood apart from your average cafe. This past Saturday was my first time to eat at AllGood. After a few refreshing $2.50 mimosas, I decided to go with the Breakfast Tacos. Served on fresh corn tortillas, the tacos were filled with organic scrambled eggs, fresh avocado, pepperjack cheese, salsa and a side of black beans. They were excellent! I’m looking forward to visiting AllGood again for lunch or dinner to try their award winning Chicken Fried Steak and hopefully catch some live music. Here’s the calendar for their upcoming shows.